Zhengzhou CamelWay Machinery manufacture mainly produce tower cranes, construction elevators, concrete mixing stations, JS concrete mixers, concrete batching machines, stabilized soil mixing stations, wheel loaders, concrete transport tanks, JZC concrete mixers and other construction machinery. Next, the company will introduce the control system of concrete batching plant. 1, USES the colored sandwich steel plate has been, have heat preservation, heat insulation function. Main part adopts central core board adornment, upstairs with internal dust removal device, the filter will host, temporary storage hopper, powder weighing hopper of dust collection, the lower dirt password lower emissions into the blender. 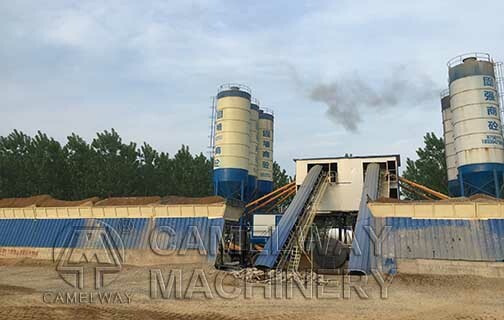 CamelWay Machinery manufacture develops and produces concrete mixing station which will satisfy your different requirements. The company also provides project consulting services, for example, power station and plant construction or the construction elevators. We will try our best to service for you and build win-win business with you. Welcome to contact us. This entry was posted in Indonesia Batching plant, Solution and tagged concrete bahcing plant by camelway. Bookmark the permalink.